KidZania's Exlusive One-day Online Flash SALE is back! Buy 1 Kid ticket and get 1 Adult ticket for FREE! Get this promo offer today only, June 17! Check complete Promo Details HERE! 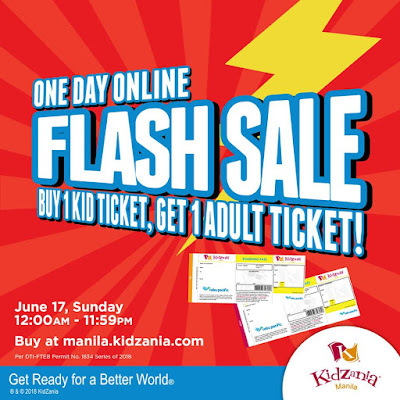 This promo is available only at KidZania's ONLINE purchase channels on June 17, from 12:00AM to 11:59PM. Buy your tickets HERE! When you book at KTX or TicketWorld, click your preferred date within the redemption period: June 17 to August 17, 2018! i. All visitors availing of the promo must be physically present in queue for verification and security checks before access. ii. Kids below 8 years old must be accompanied by an adult. iii.Tickets may be re-booked once within redemption period. iv.There are ticket allocations per day so please try other days if and when the ticket allocation for the day you prefer gets sold out. 2) Tickets will only be available for purchase through KidZania Manila website on June 17, 2018, 12:00 AM-11:59 PM for visits from June 17 to August 17, 2018. 3) Promo item is not convertible to cash or credit. It may not be exchanged with any other product or service. 4) The promo is not valid in conjunction with any ongoing discounts or promotions, including KidZania group packages. 5) In the purchase of goods and services which are on promotional discount, the Senior Citizen may avail either the promotional discount or the discount provided under the expanded Senior Citizens Act of 2010, whichever is higher.